I always enjoy the “challenge” of cooking vegetarian. I use challenge in quotation marks, because it’s pretty damn easy, but I find it scares most people. 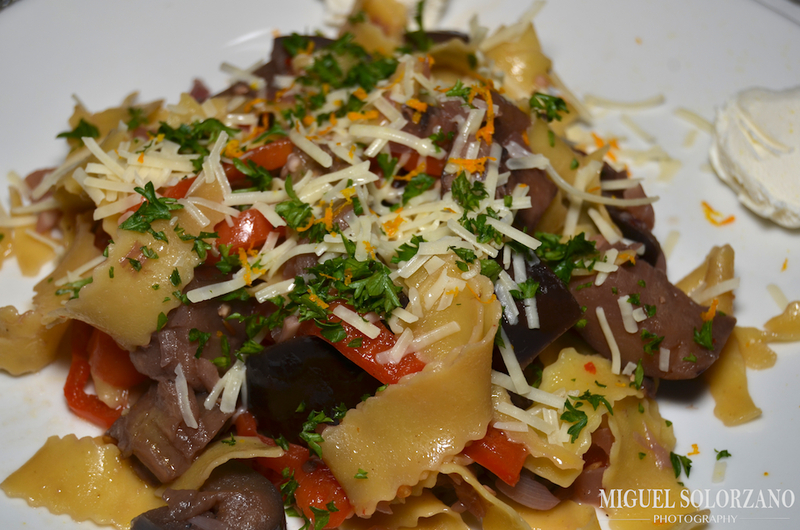 Using the fresh eggplants and mushrooms I had on hand, I decided to make a Pappardell with Eggplant and Mushroom Ragu. There are a lot of simple flavors in the dish, but what really sends it over the top for me are the fresh garnishes of orange zest, parsley and ricotta cheese. Put the olive oil in a large skillet (I used a Dutch oven) over medium-high heat. When oil is heated, saute the onion and garlic for 1 minute, careful not to let the garlic to burn. Add the eggplant, chili flakes and Kosher salt. Lower the heat to medium. Saute, stirring occasionally until the eggplant is nearly tender. Add the red pepper and mushrooms then cook for 3 or 4 more minutes. 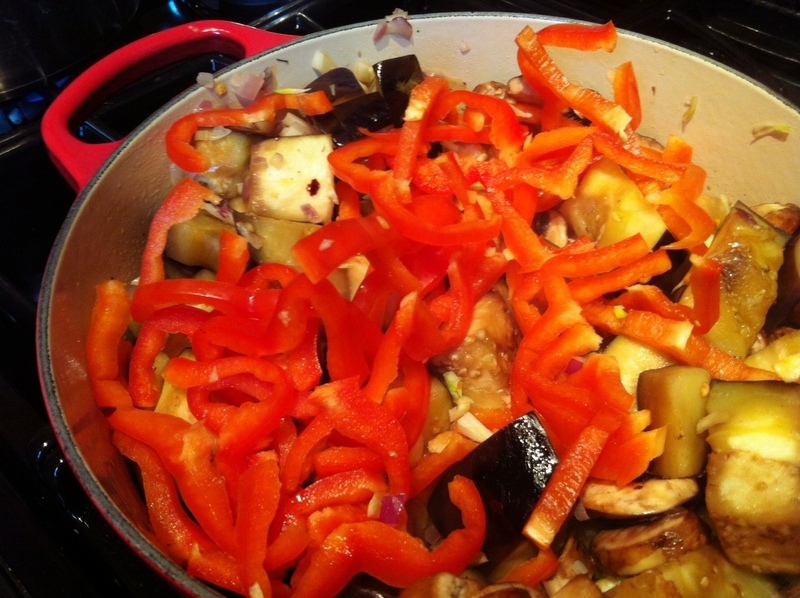 Pour in the red wine, and continue to cook until the eggplant is fully tender. Reduce heat to very low so ragu comes to a simmer. Taste and adjust seasoning. Boil the pasta according to package directions (usually about 5 minutes). Drain the pasta, but reserve 1 cup of the water. Toss the noodles with the ragu, gradually mixi in some or all of the pasta water to achieve a light glaze on the noodles. Plate the pasta then divide the ricotta, placing a few dabs on each plate. Garnish with Parmesan cheese, orange zest, parsley and black pepper then serve. This is a delicious vegetarian dish full of some classic flavors. The veggies, garnishes, cheeses and pasta work together in perfect harmony. If you can’t find or make pappardelle, I would suggest boiling lasagna then cutting it into strips. 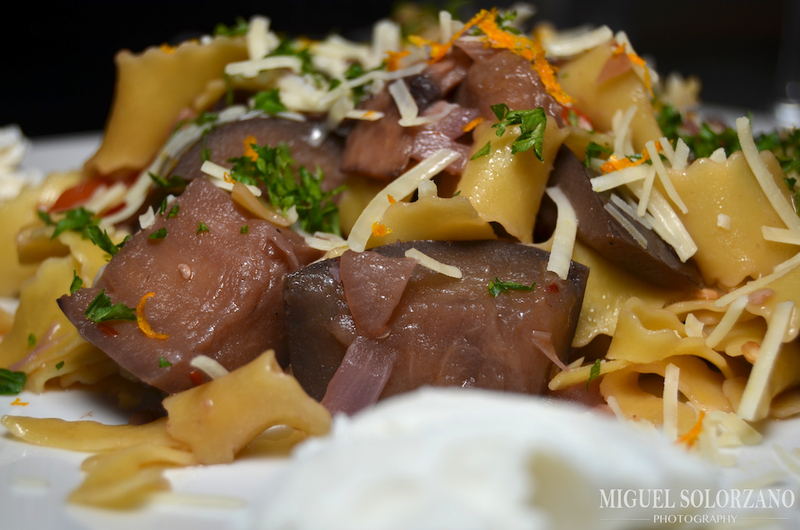 Make sure you use all of the garnishes, they really elevate this Pappardelle with Eggplant and Mushroom Ragu. Another of my recipe favorites who has been off on a vacation from posting. Good to have Po’ Boy Livin Rich back. Your pictures are absolutely beautiful. I want to eat this meal up. I will certainly have to try it some time. Where do you find pappardelle? Thank you, I will tell my photographer. This was a great meal. I was lucky enough to find pappardelle at a local grocery store, after searching the pasta aisle for a few minutes. I was skimming through the ingredients trying to find the meat. The eggplant looks like meat. Unfortunately I don’t think it will fool my hubby. But he’ll eat it as long as there is meat dinners the day before and after. LOL! Honestly, with this dish, I didn’t miss the meat at all. You can also skin the eggplant. Maybe that will help.